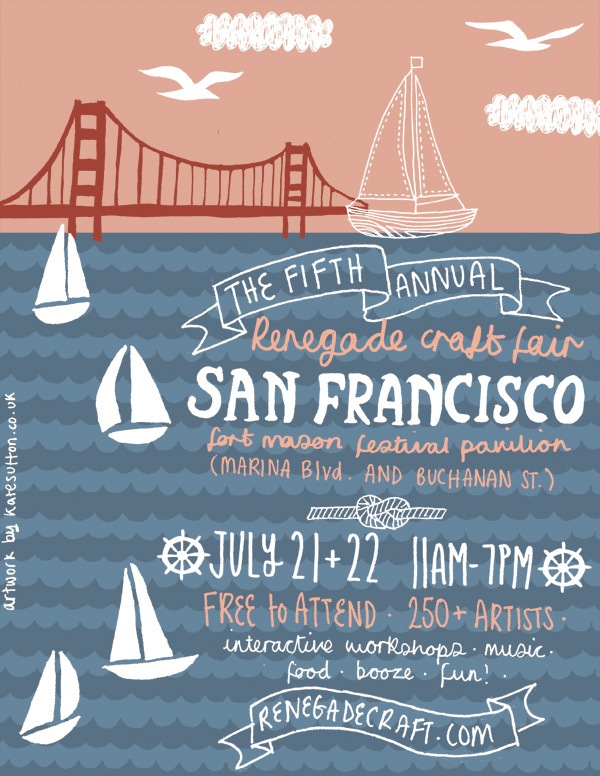 Hello California Part 1: San Francisco Renegade Craft Fair! California Dreamin’ is our theme this July. The amazing Renegade Craft Fair California Double-Whammy is happening with 2 huge, incredible craft fairs that bring the best in handmade, handcrafted artists and indie crafters to two cities: San Francisco on 7/21-7/22 and Los Angeles on 7/28-7/29. We are so excited and thrilled to be a part of these 2 amazing craft fairs, back-to-back weekends in NoCal & SoCal! San Francisco Renegade here we come! Held at the incredibly cool Fort Mason Festival Pavilion, extending out into the beautiful Bay with spectacular views. SF Renegade is unlike any other show all year long. Come check us out at Booth # 215 on your left on the long wall. We will have TONS of new prints and posters, as well and other goodies debuting in San Francisco. We’ll be vending and talking with lots of new and old friends along with over 250 wicked talented artists. Renegade San Francisco is not to be missed! Visit the awesome lists of artists here. Renegade Craft Fair San Francisco is always free to attend and full of super cool art, craft, lots of hands-on creative workshops by the Urban Craft Center, The Museum of Craft & Design, Creative Bug & Peebeo. Music by great SF DJs, tasty treats provided by SF favorites Tante’s, Neeto’s Cafe, Patti Wagon, and Rice, Paper, Scissors! and yes, plenty of adult beverages! And you can’t forget to get your photobooth photo at the free photobooth courtesy of Magnolia Photobooth Co. Design gurus from Handful of Salt will help attendees explore the craft of modern design while selling subscriptions to their soon-to-be-released print magazine and encouraging visitors to vote for their favorite vendor (like us! hint!) for a future profile in Handful of Salt. What’s not to love? Who: Us! At Booth #215! And 250+ other awesomely talented handmade artists and crafters from around the globe. What: Renegade Craft Fair San Francisco, silly. Arts, craft, fun, food, drinks, music & workshops! All right on the gorgeous Bay. When: Saturday July 21st & Sunday July 22nd, 2012 from 11am – 7pm (both days). Where: The super cool Fort Mason Center Festival Pavilion at Marina Blvd. & Buchanan St. in San Francisco’s Marina District. 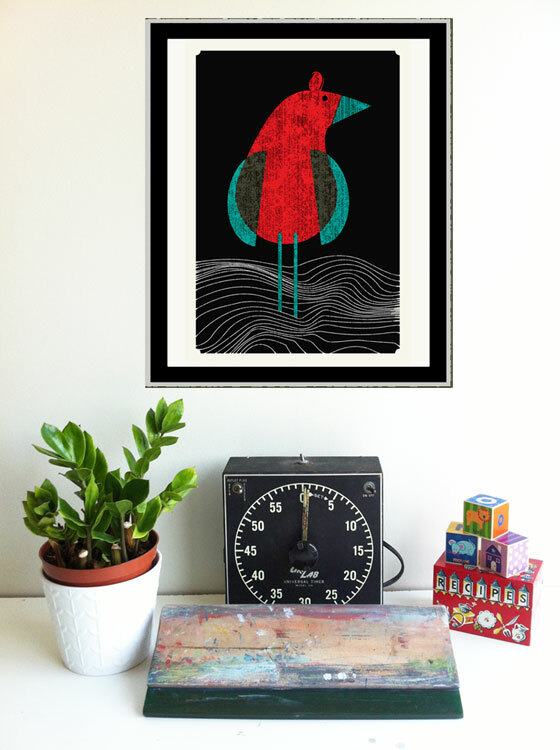 Just one of our many new art prints, “Seabird”, debuting in California at Renegade Craft Fair! Click here to purchase or for more info.